Free flip book maker for openoffice is a powerful openoffice to flipbook converter. This freeware can convert openoffice files to interactive virtual flipbook, 3d virtual page turn magazine, flash flip catalog and stunning digital flash brochure. Convert openoffice to gorgeous flipping ebook; powerful custom setting to make you own virtual flash ebook; optional output formats: html, zip, exe, app, mobile version and burn to cd; available to portable devices like ipad, iphone, android mobile phones. Quick sharing via e-mail, facebook, google, twitter; google analytics integration tracks the statistics related to your flip book. 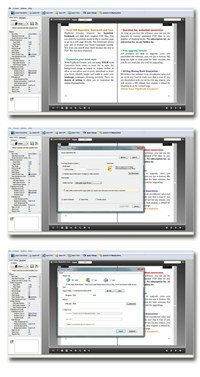 Free Flip Book Maker for OpenOffice is an utility that works under windows xp, windows vista and windows 7. It supports both 32-bit & 64-bit windows editions, therefore it could run faster on 64-bit computers. It is Free so you can download it and share it with your friends. Estimated download time for Free Flip Book Maker for OpenOffice on a common adsl connection is less than a minute. Version 1.7 was released two thousand two hundred forty six days ago by FlipBookMaker Ltd.. Click the green download button to download it now.